The surging demand for enhanced automated systems in order to achieve operational efficiencies is primarily driving the market for commercial aviation crew management system globally. The growing air traffic and increasing airlines fleet are currently boosting the demand for commercial aviation crew management systems market worldwide. In addition, the escalating demand for professional automated systems to support swift decision making is also analyzed as a major driver to the growth of the global commercial aviation crew management system market. Increasing research and development initiatives undertaken by various government and non-government organizations worldwide are expected to boost the market for commercial aviation crew management system globally during the forecast period from 2015 to 2023. Owing to the increasing investments and growing demand from various airlines, airport authorities, governments and airline service providers among others, the market for crew management systems is currently experiencing intense competition among the system providers. As a result of this, the market shares of the key players are expected to undergo significant change over the forecast period. The global commercial aviation crew management system market has been segmented on the basis of type which includes software, hardware and services. The crew management software segment is estimated to be growing at a very rapid pace globally owing to their multiplatform applicability. The services segment is rapidly gaining importance among the airlines and airport authorities owing to the focus on quick modifications and upgrades over the years and hence is estimated to be growing at a substantial pace from 2015 to 2023. The commercial aviation crew management system perform functions such as crew manifest, crew manning, sick, vacation, and absence management, training, special capability and credentials and contract rules management among others. The automatic performance of the crew management systems facilitate in reducing additional operational costs and optimization of resources on a regular basis. Owing to which, the key players in this market are heavily investing in research and development initiatives to develop improved crew management systems and cater to the mounting demand globally. Based on the geographical segmentation, North America was estimated to be leading the global commercial aviation crew management system market with more than 40% of the market revenue share in 2014 and is expected to continue its dominance throughout the forecast period till 2023. The European commercial aviation crew management system market is estimated to be growing at a significant pace, owing to growing air traffic and evolving technological advancements in the region. Europe is estimated to currently account for the second largest share in the global commercial aviation crew management systems market. Following North America and Europe, Asia Pacific (APAC) was estimated to be the third largest region in the global commercial aviation crew management system market in 2014. Asia Pacific is projected to be the fastest growing region in the commercial aviation crew management system market from 2015 to 2023. The Rest of the World (RoW) region is expected to experience a surge in demand for commercial aviation crew management system over the forecast period and offer growth prospects to the manufacturers, both regionally and globally. The growth of Rest of the World market is attributed to various modernization initiatives and expanding capacities of the low cost carriers in the region. The key industry players have been profiled on the basis of company overview, financial overview, business strategies, and key developments in the field of commercial aviation crew management systems. Major market participants profiled in this report include Sabre Corporation, Hexaware Technologies Ltd., AIMS Corporation, IBS Software Services, Hitit Computer Services, Jepessen Sanderson, Inc., Lufthansa Systems, Prolog Development Centre A/S and BlueOne Management S.A./N.V. among others. Several airlines have expanded their fleets over the course of time, which has made operations more complex for them as compared to earlier times. This has led to the need for a system that organizes and effectuates efficient management of the entire aviation industry with a fundamentally grounded system to organize the aviation crew. Automated systems have become an integral part of the aviation industry. The operational efficiency that they bring about has increased their demand. This has bolstered the market for commercial aviation management system. These systems ensure that the industry does not suffer backlogs due to unfavorable management of the crew. Hence, they have become extremely important in the aviation industry. The rising air traffic has prompted various government and non-government organizations to make ardent initiatives in the research and development of better crew management systems. 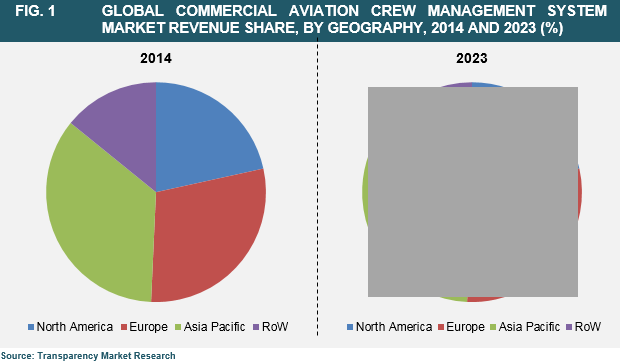 The global market for commercial aviation crew management system is segmented by type and region. The sub categories within these segments are an important parameter to decide the scope of each segment. The report by Transparency Market Research (TMR) outlines the growing vitality of the market and projects the trends and figures that would resonate through the market. There have been immense speculations about the growth of the market which have been highlighted in the report. Several historic, contemporary, and anticipated trends have been enunciated in the report. The entire aviation industry is prolifically involved in optimizing the resources within the industry to make the system more agile and responsive. Since, the crew within the industry is an important human resource, it calls for a fundamental change in its functioning, in turn arising the demand for aviation crew management systems. Reduction of costs within the aviation industry is an important standpoint for comprehensive growth, thus, it is important for airlines to employ crew management systems that increase operational efficiency and reduce costs. Technological advancement has been a key feature of the aviation industry which has furthered the demand for the market. Moreover, the attractive prospects offered by automation have also been a solid reason for the rising demand for aviation crew management systems. The rising connectivity amongst various geographical pockets is expected to keep rising the volume of fleets by airlines. This would act as an immensely bright prospect for the market because more airlines would now look to resort to crew management systems. Owing to a number of investments in the aviation industry by government and non-government entities would be a haven of opportunity for the market. Amongst the various regional segments, North America has topped the tables in terms of market share accounting for 40% of the market share in 2014. The region is expected to maintain its reign up until 2023. Europe ranks second on the performance scale where the market has grown on the pretext of technological advancements and rising air traffic. Asia Pacific is expected to register the highest growth rate in the coming years while the rest of the world is to undergo sturdy growth. The various players in the commercial aviation crew management system market are expected to resort to innovative business strategies to outperform competitors. Moreoever, the key developments in the field would be a source of growth for these market entities. The current market players include Prolog Development Centre A/S, Hitit Computer Services, AIMS Corporation, IBS Software Services, Lufthansa Systems, Jepessen Sanderson, Inc., Hexaware Technologies Ltd., Sabre Corporation, and BlueOne Management S.A./N.V.